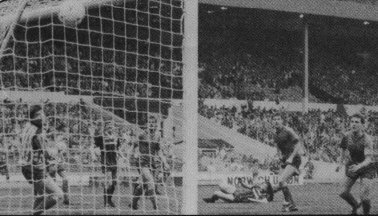 Mick Farrelly's goal in the 1986 Trophy Final. Mick Farreliy will always be remembered as the man who scored the winner in the 1986 FA Trophy final against Runcorn and for that alone he can be considered a "legend" but he contributed a lot more than that in his time at Moss Lane. He became a versatile utility player who performed well wherever he was asked to play. Though originally signed as a midfield player, in his time at Moss Lane he played in every shirt number except numbers 1, 9 and 11, eventually settling in as right back. He filled the recently departed Phil Gardner’s utility role to a ‘T’. Farrelly started his footballing career with Preston North End; signing professional forms in June 1981, having previously won four England Schoolboy caps. Over the next 4 seasons he played 77+5 League games, scoring 4 goals for Preston before being released at the end of the 1984/85 season. Preston’s loss was Altrincham’s gain and unlike many players coming to Moss Lane, Mick came with the right attitude and over the next four and a bit seasons gave sterling service. Mick won an FA Trophy medal in his first season, his winner coming from build up play from Gardner which put Anderson away on the right. He pulled back his cross to be hit by Farrelly, whose well struck shot hit the cross bar, bounced down and span viciously high into the roof of the net. The following season he was a Cheshire Senior Cup finalist and played in Altrincham's FA Cup wins against Blackpool and Birmingham City (as sub). He was also considered good enough to win three semi professional caps in 1987 against Ireland, Holland and Scotland. He was transferred to Macclesfield early in the 1989-90 season and went on to give them five seasons of quality before moving to Winsford United for two seasons in 1994/95 and, finally, he went to Radcliffe Borough from 1996/97. Joe was an all action left-sided midfield player with an ability to score goals, (quite often spectacular drives from outside the box). He was to have one glorious season at Moss Lane before injuries and the arrival of manager Les Rigby finished what could have been an even greater Moss Lane career. Pritchard started his footballing career as an amateur at Liverpool but due to disagreements with the management never turned pro. Instead he signed for Tranmere Rovers in September 1962 and became a great utility player (wearing 8 different outfield shirts). He made his debut the following May and scored twice against Chester the following week. He made only 15 appearance in his first three seasons before establishing himself in the first team in the 65/66 season. The following season he helped Tranmere to promotion from Division 4 with nine goals in 41 League appearances. His best season followed when, as an ever present, he scored 11 goals. Overall he scored 31 goals in 206 league and cup appearances. He was released at the end of the 68/69 season and joined Ellesmere Port Town for the 69/70 season. He joined Altrincham at the end of the 72/73 season along with team mates Gerry Casey and goalkeeper Peter Eales, with all three making their debut in the two-legged NWFL Final against Buxton. Joey scored two goals on his debut in the 5-2 home leg win. All three started their Altrincham careers with a winner's medal after just two games! The following season Joe missed only one game and scored 25 goals in 62 appearances and finished the season as Player of the year and with a NPL cup finalist's medaL He featured in Altrincham's FA Cup run and played well in both of Altrincham's ties with Blackburn Rovers. He was never to recapture the sensational form of that 73/74 season when he formed a midfield with Lennie Dickenson and Graham Heathcote that had steel and creativity. 0ver the following two seasons (although scoring on the opening day of both! ), he was in and out of the side due to injuries and the arrival of Les Rigby as manager, who somehow didn’t fancy Pritchard's midfield skills. He won a second NWFL winners medal in 74/75 but his career was definitely on the wane, though when given the chance, Joe showed he could still deliver the goods as demonstrated by a hat trick in the 3-1 win at Ashton United in the NWFL during his final season. He played his final game for AItrincham in the Cheshire Senior Cup 2nd Round defeat at Nantwich and that was it; his Altrincham career (and indeed his senior football career) was over. Ken McKenna (centre foreground, blue shirt) playing at Moss Lane in April 2001 for Alty Vets against Alty Supporters. Ken McKenna joined Altrincham from Telford United with a reputation as a goaIscorer and left two seasons later as a legend. At 5ft 10ins he was not the tallest of strikers but he was quick, strong and he certainly could finish! He formed a lethal partnership at Moss Lane with John Brady, a partnership that took Altrincham so close to the Conference title in 1990/91. He started his senior playing career with Poulton Victoria and went on to have 5pells with Tranmere Rovers in the Football League (4 League games), Telford United, Runcorn (where he won a Cheshire Senior cup winner's medal), and a second spell with Tranmere Rovers (scoring 4 goals in 15 League appearances) before going back for a second spell at Telford United, arriving at Moss Lane for the start of the 90/91 season. In that first season he scored a total of 33 goals in 56 appearances in all competitions and finished the season with the ‘Player of the Year' award. He was part of an Altrincham side that went 28 games without deteat and scored in 10 consecutive games. He also managed hat tricks against Merthyr (9-2) and Boston (6-1) and Cheltenham (4-1). Altrincham finished third in the league and made the semi-finals of both the FA Trophy and the Cbesbire Senior Cup. The foIlowing season John King had left and Stan Allan had taken over for what was a tumultuous season, wbich ended in Allan’s sacking and Altrincham barely surviving the drop. McKenna however continued to score goals and helped Altrincham to the semi-finals of both the League Cup and the Chesbire Senior Cup (again). At the end of the season McKenna was on his way to Barrow, (allegedly sacked for failing to turn up for the last game of the season at Yeovil), a tragic loss for an Altrincham side that was destined to struggle under new manager Gerry Quinn. He later moved into the League of Wales, firstly joining Conway, followed by Bangor City before finally ending up at TNS where today he is manager (and still an occasional player and scorer!). Ken has already had a measure of success in management having taken TNS into Europe and was a major force behind their inaugural Championship the year before.